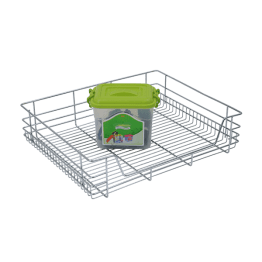 Our TU Baskets are Low-profile space-saving design makes it easy to store pans, mixers, Kitchen tools, pots, and many more items. To keep everything in your cabinet promptly available so you don’t need to get down staring you in the face and knees hunting down what you need, with the assistance of the Pull Out Cabinet Wire Basket. 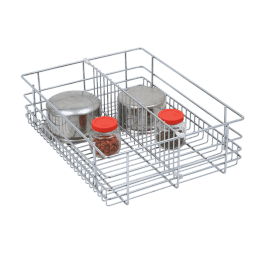 This drawer wire basket is developed of business review stainless steel 202 with chromed, to give you durable solid utilize. 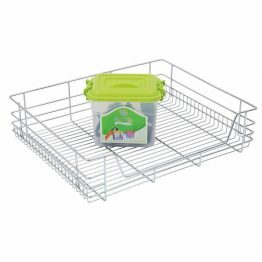 This TU Baskets (Pull-Out Basket) drawer highlights modern review metal roller drawer sliding channel, which offers a smooth and proficient Pull out design to keep all Cabinet substance available. 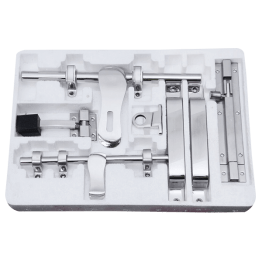 This Pull out outline works extraordinary for conveying the request to a restroom, kitchen, pantry or carport cupboard, and will effortlessly mount to the wood base of any cupboard that is no less than 20 inches profound with an opening of 15 inches or more. All such items like Vegetable Oils Pulses, Cereals food grains which need bulk storage can be kept in this Drawer Pullout system. smooth retrieval and you can access all the stored products. This is a full extension system, here no pushing and pulling of storing containers is required.